My niece gets eczema-like flakiness on her scalp. It was originally diagnosed as cradle cap, but when the condition persisted into her toddler years and didn’t respond to cradle cap treatments, my sister suspected a dairy allergy. A couple weeks after removing all dairy from her diet, my niece’s scalp wasn’t dry and flaky anymore. This spring I experimented with making dairy-free desserts for my niece. Two were big hits with our whole family, the other, was good but not great. I have an idea of how to make it better, though. 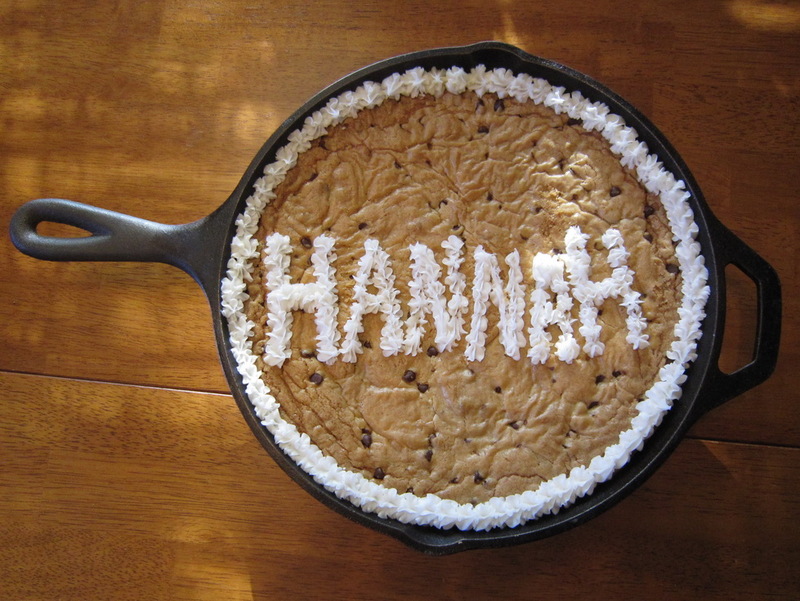 On Hannah’s birthday I made a dairy-free Chocolate Chip Skillet Cookie in addition to her birthday cake. I found the recipe for a CC skillet cookie via Pinterest, tweaked it a bit and Viola! Heat oven to 375 degrees. Adjust oven rack to middle position. Lightly butter pan. Whisk together flour and baking soda; set aside. Remove from heat. Pour heated butter through a sieve into a heat proof bowl. Stir in remaining butter until completely melted. Add all three sugars, salt and vanilla to bowl with butter and whisk until fully combined. Add egg and egg yolk, whisk until mixture is smooth and no sugar lumps remains, for about 30 seconds. Let mixture stand for 3 minutes then whisk for another 30 seconds. Repeat step four 2 more times until mixture is thick and shiny. Stir in flour until combined. Stir in chocolate chips until combined. For St. Patrick’s Day, I made the Coconut Oil Fudge recipe that I found on Common Sense Home blog. It was good, but I didn’t add the nuts or dried fruit in the recipe and you could really taste the coconut oil. In the bowl of a standing mixer stir coconut oil until creamy with no lumps (if oil is too thick, set bowl in warm water). (You want the oil soft, not liquid. If it is liquid, the other ingredients will settle to the bottom of the pan instead of staying mixed with the oil. If this happens, you can warm the whole thing and remix.) Add cocoa powder and sweetener, mixing after each ingredient. Mix in the dried fruit, (coconut), and nuts. Spread fudge into 7″x11″ or 9″x9″ inch pan and refrigerate or freeze until firm. Cut into squares and serve. Keep refrigerated. What Easter basket is complete without chocolate? My very favorite are buttercreams. I decided to make dairy-free buttercreams for my niece for Easter and they were fantastic! For the filling I used this Irish Potato recipe from Cooks.com, minus the coconut (yes, Irish Potatoes are buttercreams plus coconut and rolled in cinnamon). Mix ingredients by hand or in mixer. When combined put in refrigerator for at least 2 hours. Melt Enjoy Life chips in double boiler. Scoop filling with spoon or cookie dough scoop and roll in melted chips. Remove and place in paper candy cups or on wax/parchment paper. Refrigerate until set and store in refrigerator. Note: the filling warms easier and faster that true buttercreams so you may need to work in small batches so it doesn’t get too soft to work with. I’m already looking for summer desserts that I can make for my niece and can’t wait to share them with you! Gnocchi can be made 2 ways… with potato or Ricotta cheese. I use my grandmother’s recipe to make mine and use Ricotta. 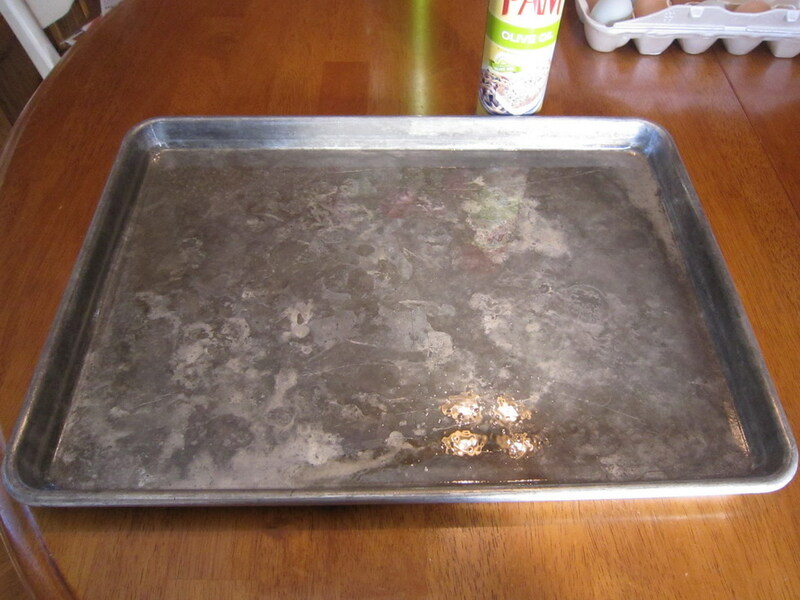 Step 1 – Put wax paper on cookie sheets. Step 2 – Measure out ingredients and make “well” in center of flour. Step 3 – Mix together eggs, Ricotta and parmesan. Step 4 – add wet mixture to well in flour and knead dough (don’t over-knead or the dough will become tough). Step 5 – Wet a towel with water, wring it out and cover dough so it doesn’t dry out. Cut of small amount of dough off. Step 6 – Roll into long “rope” and cut into small pieces. Step 7 – Roll pieces of dough on gnocchi boards or forks. Step 8 – Freeze gnocchis on cookie sheets then put into freezer bags (you can also cook the fresh gnocchis). Step 9 – Cook in boiling water until they all float. Serve in a dish with gravy (we don’t call it sauce!) and enjoy! My mom-mom was a little Italian woman who could make anything. Crafts, cooking, baking … you name it, she could do it. Every Sunday our family would gather at Mom-Mom’s and Pop-Pop’s house for dinner. Almost always a homemade Italian meal. The only exceptions were the dog days of summer when Pop-Pop would grill. 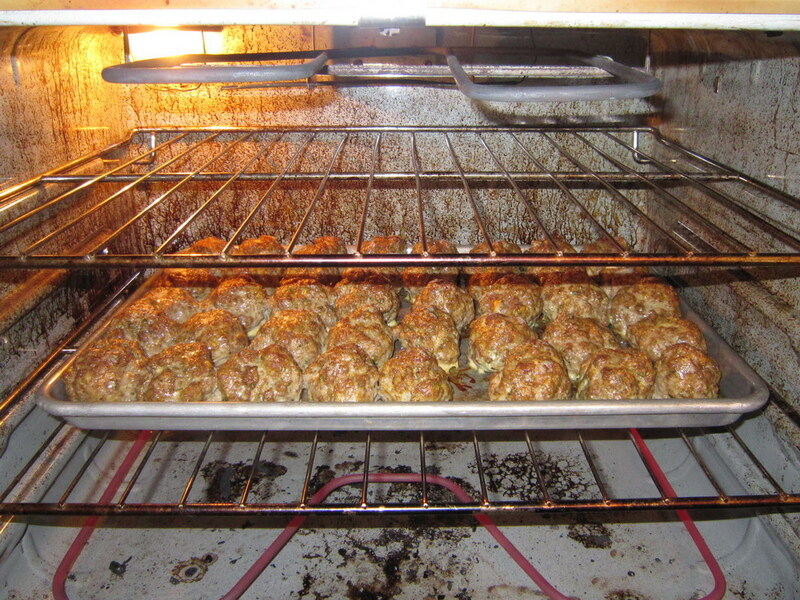 All of us grandkids helped make spaghetti, ravioli, gnocchi, manigot (manicotti), lasagna … and meatballs. I’ve promised a lesson on making gnocchi, but today we’re talking meatballs. Mom-Mom’s meatballs were famous. She’d never make less than 50 at a time, and more often would make 100-200. She’d sell meatball sandwiches each year at the church’s June bazaar, along with fresh-squeezed lemonade, and people would flock to her booth. Mom-Mom never measured ingredients and didn’t have a recipe for her meatballs so trying to replicate them was not always easy. She had it all in her head, but we kept asking for a written recipe. Thanks to our dear friend, Melba, we got one. One day when Mom-Mom was making her meatballs Melba was visiting. She took a pen and paper and wrote down everything Mom-Mom put in the mix. Every time I make meatballs, I think of my mom-mom. I also think of Melba and how grateful I am for the recipe in my hands, because it’s more than measurements – it’s a connection to wonderful memories. Now to the recipe and the lesson! garlic powder, parsley, basil, grated locatelli cheese, salt, pepper, italian seasonings to taste. Spay a baking pan with olive oil Pam or rub with olive oil. Turn oven on to 350 degrees. Mix ingredients in a large bowl by hand. (I suggest that you remove any rings) Instead of salt and pepper I like to use Nature’s Seasons (bottle with blue cap). Be gentle while you mix the meat or your meatballs will be very dense. I forgot to put the bread crumbs in the photo above! 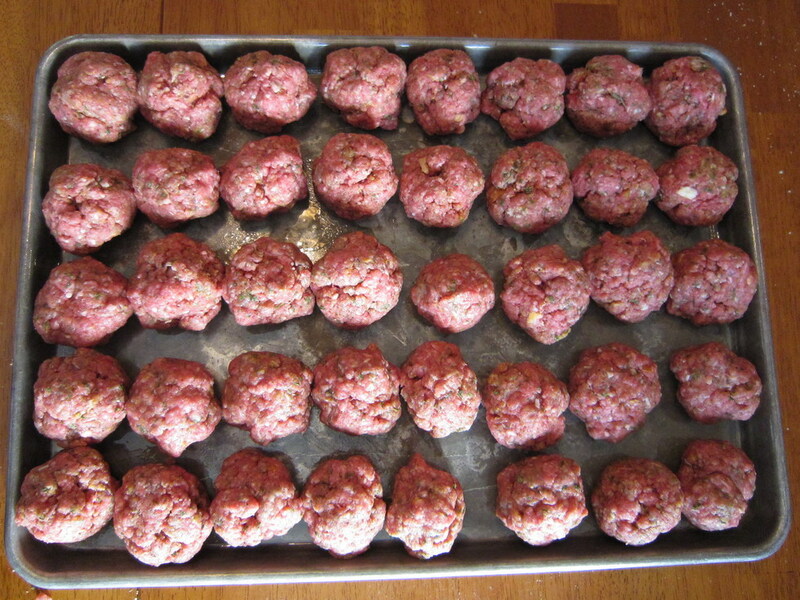 Roll the meat into meatballs. Try to keep them somewhat uniform in size so they cook at the same rate. Also, don’t pack them while you’re shaping – they’ll end up too dense. Bake in your preheated oven for 30-45 minutes, or until browned. Now they’re ready to eat, add right to your spaghetti gravy (no, we don’t call it sauce in our home), or cool and freeze. Any juices in the pan can also be added to the gravy or frozen for future use. Don’t throw them away … I believe Marie on the TV show Everybody Love Raymond called those juices liquid gold! I hope you enjoy making and eating these meatballs as much as I do!